​At SAMES KREMLIN, the secret to our success is our talented employees. Opting for SAMES KREMLIN is entering into a familly to live an exciting professional adventure with men and women proud to contribute to a shared result. We share values of operational excellence, initiative and innovation. We are all driven by the desire to better serve our customers, and we have the ambition of proposing to our co-workers to work within a positive environment. We need your creativity, energy and skills to realize our ambitious plans and to satisfy our customers' needs. If this perspective speaks to you, we will be happy to welcome you to our team! We offer career opportunities in many areas. Do you want to be a part of the SAMES KREMLIN Family? At the heart of an industrial company, our teams take care to passionately achieve the manufacturing of high quality products. It is our aim to ensure on-time delivery to our customers. Take the plunge and apply today! Our Marketing team, supported by a dedicated sales team, is the voice of our customer. We are focused on translating customers’ needs into connected and innovative products. If you are talented, with a positive attitude, and have found the company to meet all your needs - join us! 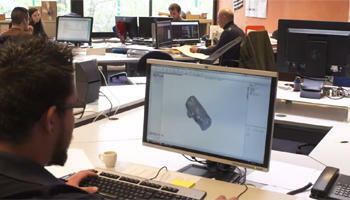 We create and design products that respond to the demands of tomorrow. We are the heart of the innovation that makes the impossible possible. Our HR team with the operational staff work every day to evolve the talents within the company. The finance and IT teams, in link with all trades of SAMES KREMLIN, play a critical role in overall performance of the enterprise and the deployment of a strategy for development. We are committed to developing a CSR policy. Our motto - "Work together to achieve common goals." Do you have the smile and want to be a real actor in our company? Join our team! The SAMES KREMLIN production teams define, organise and perform the operations that manufacturing our product range involves, spray gun bodies, aircaps and tips, pumps parts, bellows, regulators....Given the complexity of machining our parts, we focus on our unique knowledge developed since 1925. "My work consisted in the industrialization of the mechanical parts from the plans of the Research & Development. I created machining processes, chose cutting tools, studied assemblies, realized programs to make parts; Then, I assisted the operators at the machine shop for start-ups and debugging. This part of my work was very interesting because you learn a lot in the workshop at the foot of the machines. Work on the improvements of existing processes by choosing new tools, choosing new operating modes, to participate in the investments of the new means of production..."
Learn more by watching the testimonies of Claude!